One of the Boston Marathon bombing suspects is dead and the second is on the loose and said to be “armed and dangerous” after a dramatic shootout in the suburb of Watertown. The terrorist, dubbed “Suspect 1” by the FBI, died in hospital after explosions and machine gun fire rocked the Watertown area hours after a police officer was shot dead at the nearby MIT campus. Boston descended into chaos on Friday morning as police dramatically held a suspect at gunpoint after multiple shots and explosions were heard in the suburb of Watertown. 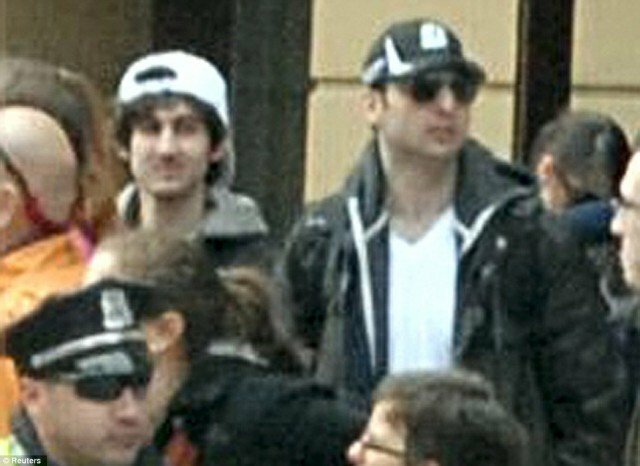 The drama unfolded hours after the FBI released images of two men named as suspects in the deadly Boston Marathon attacks and the Boston Globe has said the two men involved in this evenings shoot-out are those same men. Police screamed at reporters on the scene to turn off phones “if they want to live” as they hunted for the suspects – fearful that improvised explosives could be remotely detonated. Dozens of police officers, FBI agents, national guard, K-9 units and SWAT teams rushed to Watertown after midnight after a reported car chase involving the two suspects in a black 2013 Mercedes. According to eyewitness reports, two men believed to be in their early twenties engaged in a furious gun fight with dozens of police on a backstreet of Watertown.